Our patron, St. Landry (also “St. Landericus” and “St. 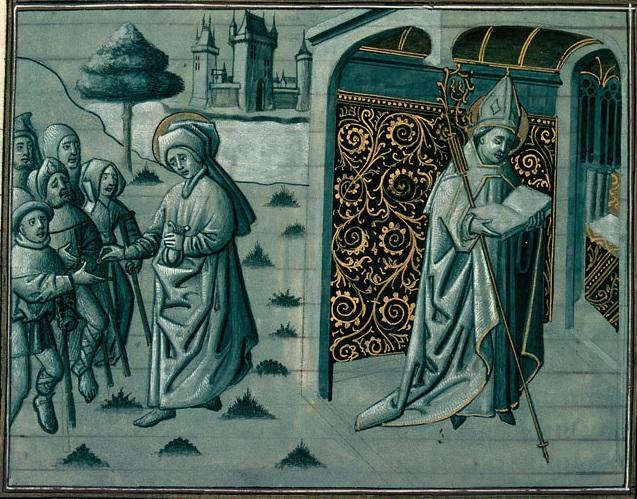 Landry the Confessor”), was consecrated bishop of Paris in 650. During the famine of 650-51, Saint Landry sold all of his personal possessions, as well as some of the furniture and sacred vessels of the church, to feed the poor. In 651, Saint Landry founded a hospital dedicated to St. Christopher near the Cathedral of Notre Dame. The hospital exists today and is called the Hôtel-Dieu de Paris. However, it was decided recently that the building could no longer be used as a hospital, so it will serve another purpose in the future. Under the direction of Saint Landry, the original church of St. Germain l’Auxerrois in Paris was built, and it became the parish of the kings of France. Saint Landry served as Bishop of Paris until his death, which occurred in 661. He was buried in the Church of Saint-Germain l’Auxerrois, and today you can see his statue and frescos painted in St. Landry’s Chapel in the church. Although his tomb still exists, his remains were moved to another location during the French Revolution to prevent desecration. The current location of his remains is unknown. We celebrate St. Landry’s Feast Day on June 10.